Christmas has come early at Print Shop Window headquarters this year – A package containing a newly acquired set of caricature prints finally arrived in the post this morning. 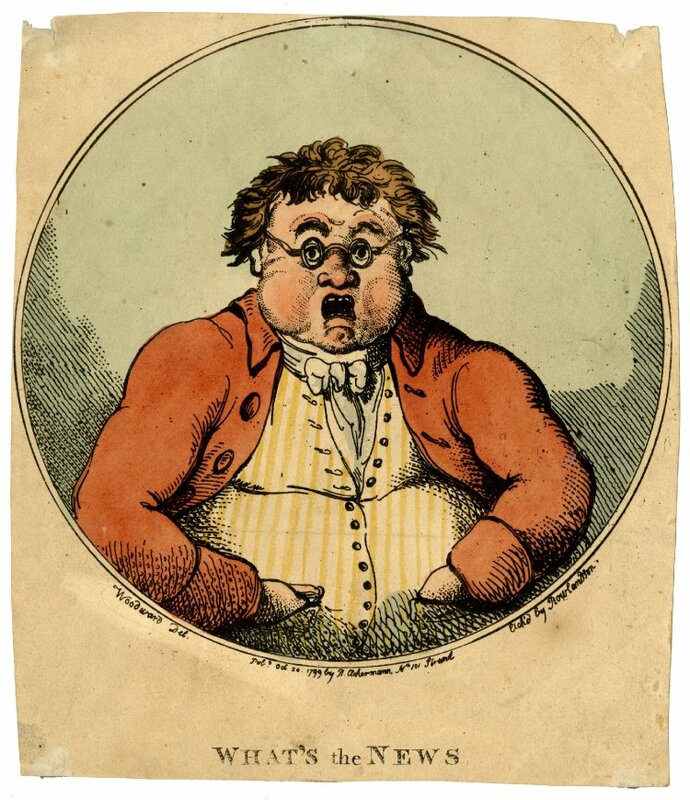 Most of the prints date to the second half of the 1790s and appear to have been taken from a larger contemporary collection of caricatures that was dominated by the works of Isaac Cruikshank and the publishers William Holland and S.W. Fores. One of the most interesting and unusual items to emerge from the furiously shredded pile of brown paper and packing tape that lay on my kitchen floor this morning, was this caricature of William Pitt. 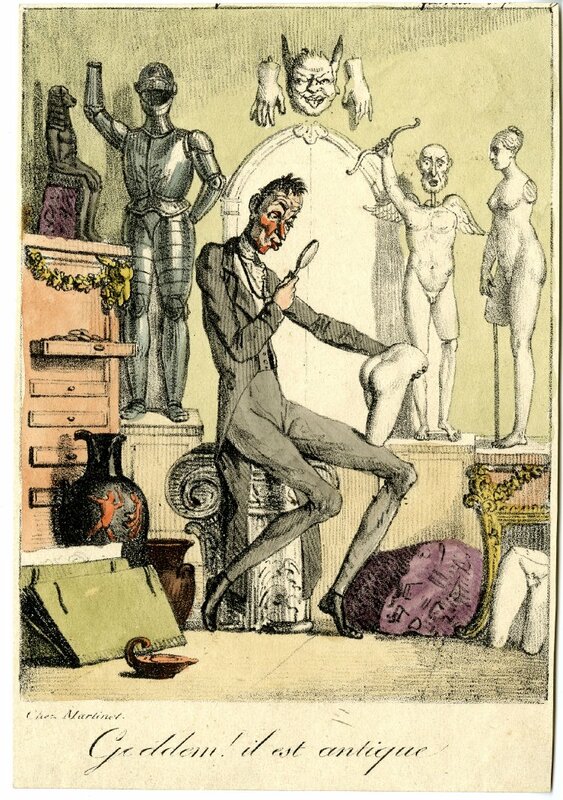 It was produced by an anonymous artist for the publisher and printseller William Holland in May 1797 and shows the Prime Minister in the guise of an anatomical model. His torso and skull have been opened and their contents are marked with a series of humorous labels which indicate the various physiological and psychological attributes which mark Pitt out as a successful politician. Hence we can see that his knees are labelled “flexibility”, his heart “money”, the brain “calculations” and his stomach is awash with “claret and red port”. It’s an image which in part reflects the broader fascination with the development of anatomical science in this period. Medical practice was still a highly deregulated trade in the late eighteenth-century and the market for healthcare in Georgian England was awash with a dubious collection of enthusiastic amateurs, backstreet doctors and out-and-out quacks, looking to capitalise on the sick and the infirm. 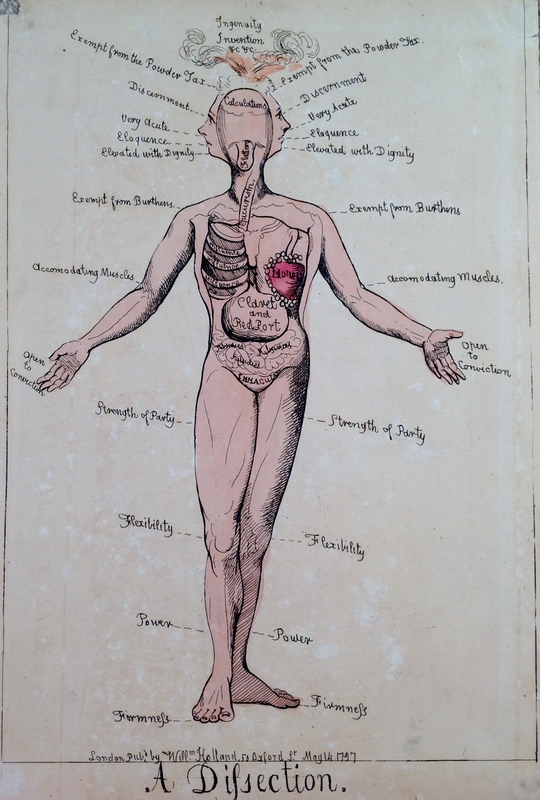 Consequently, medical text books and charts appear to have had a surprisingly broad audience, with many of London’s print shops and booksellers carrying anatomical diagrammes and popular books, such as John Bell’s Engravings Expressing the Anatomy of the Bones, Muscles and Joints (1797) among their stock. The humour of this particular print no doubt being reinforced by the fact that it may well have been displayed alongside the serious studies of human anatomy that were sold by Holland and his wholesale customers. John was particularly keen to challenge any suggestion that Ackermann was not directly involved in the production of the prints he sold. He pointed out that Ackermann may have had up to 16 printing presses in operation at any one time while he was resident at 101 Strand and also owned a host of other printing-related paraphernalia, such as a set of gas cockspur burners that were used to prepare plates for pressing. He also felt that the various payments to stationers firms which are recorded in the ledgers relate to the purchase of blank paper for printing, rather than the wholesale purchase of stationery for re-sale, although acknowledged that it was impossible to verify this without a copy of the original trade bill. John also took exception with my theory about the large payments that Ackermann was making to printers as being evidence that he had outsourced his printing activities. John was convinced that although Ackermann used letterpress printers to produce text for his publications, the images themselves were still engraved and printed in-house. 1) My description of William Clowes as an “engraver and printer” was inaccurate. Clowes was a printer and stationer and is listed as such in the 1819 London Post Office Directory. 2) The engravings by J.B. Papworth which appeared in Rural Residencies had previously been published by Ackermann in 1816-17. Payments to Papworth which appeared in the ledgers for 1818-19 were therefore more likely to relate to his work on Pictorial Cards. 3)Thomas Unwins and Samuel Prout were not involved in the production of Flowers: A Series of Studies from Nature Drawn on Stone. The payments to Prout which appear in the ledgers may relate to a series of drawing books which the artist had produced for Ackermann in 1819. Of course, Twelve months with Rudolph Ackermann was really only a first attempt at divining something useful from the data that was emerging from the ledgers. I said at the time that any conclusions were open to re-interpretation and revision as the process of transcribing the ledgers continued, and this has indeed proven to be the case. At the very least I can say that I am pleased that this project has sparked something of a debate and look forward to seeing what other information about Ackermann’s world emerges from the ledgers as we continue our work. 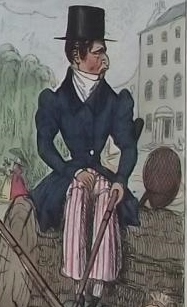 This is a pristine example of a relatively rare angling caricature by the English satirist and illustrator Robert Seymour. It was published by Thomas McLean of London’s Haymarket sometime around 1830 and may have been a forerunner to the series of humorous lithographic illustrations that Seymour was commissioned to produce for Richard Penn’s Maxims and Hints For an Angler: and Miseries of Fishing in 1833. The 1820s and 1830s witnessed the birth of angling as a recreational pastime of the British urban middle classes. It was a craze that was reflected in a growing number of caricatures by Seymour and his contemporaries such as Henry Heath, Alfred Crowquill, C.J. Grant and John Doyle; all of whom sought to profit from those keen to celebrate or denigrate the arrival of this new sport. The title and subtitle of the print contain numerous punning references to the culture which grew up around fishing at that time. 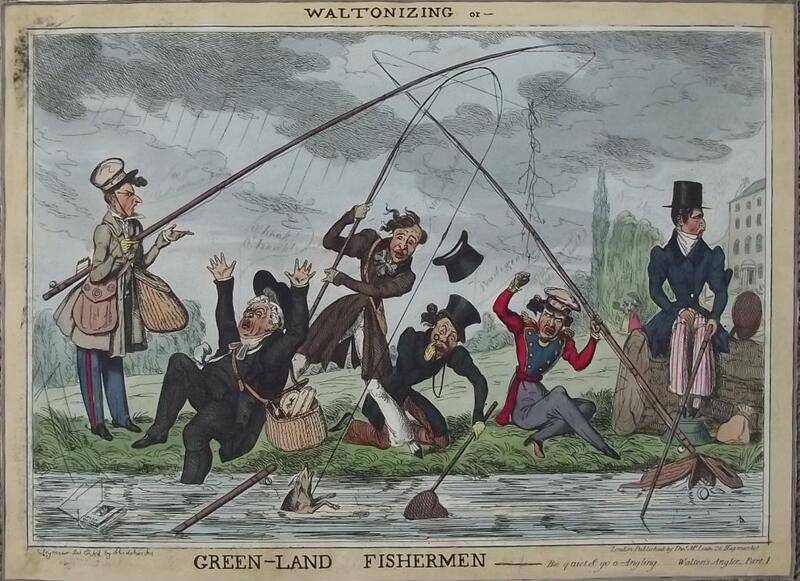 “Waltonizing” is a reference to Izaak Walton, the godfather of English line-fishing, whose 1653 treatise The Compleat Angler had been republished in a hugely successful revised edition in 1824 (a copy of which is being used as bait by one optimistic fisherman in the print). The quote which appears at the foot of the design; “Be quiet to go a-Angling” is taken from the second chapter of Walton’s book and is evidently intended as a humorous counterpoint to the chaotic scene unfolding in the image above. The subtitle; Green-land Fisherman, is presumably a reference to the ancient thoroughfare of Green Lane, which ran alongside the River Lea through the London suburb of Harringay and was a popular out-of-town fishing spot in Seymour’s day. The image contains a comical parade of six weekend fisherman who are struggling to get to grips with their new hobby. On the far left we see an affluent angler arrayed in his fashionable country attire, engaged in an angry exchange with an army officer whose line has become entangled in his own. 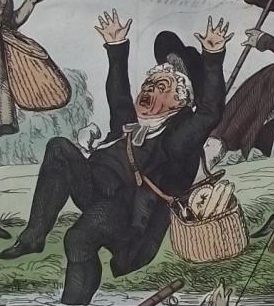 To his right, a fat parson slips and falls into the river, exposing a well-stocked picnic basket which hints at the real motivation behind his trip into the country. Next come two dandies who demonstrate their ignorance of the sport by trying to land a piglet that has fallen in the river. Finally, another well-dressed angler sits glumly staring into space as his rod dangles ineffectually in the water; undoubtedly a jibe at those whose interest in fishing was motivated entirely by a desire to be seen keeping up with the latest trends. The contemporary owner has added their own text to this print in pencil. The speech-bubbles are a little faded but we can still make out the clergyman shouting “Oh Izaak, Oh Izaak” and one of the useless fops enthusiastically exclaiming “prodigious” as he tries to catch the drowning pig in his net. Modifications such as these were actually relatively common and reflect the strong tradition of the amateur in English caricature during the long eighteenth-century. The habit of amending finished caricature prints is a subject which has largely escaped serious historical study, perhaps because modified prints rarely appear among the immaculate caricatures that make up the bulk of the collections owned by public and academic institutions. Nevertheless, the frequency with which one encounters such prints in private collections, indicates that contemporary consumers had a far more tactile relationship with caricatures than we tend to assume and that some prints may even had been deliberately designed to allow for this interaction. The figures in this print for example, are arranged in a manner which conveys a sense of discourse, while the surfeit of sky in the middle ground leaves ample room for text, but no speech has actually been added to the original plate. Could it be that McLean deliberately asked Seymour to omit text from his design because he knew that his customers liked to add their own witticisms to the prints they bought? Anon. Goddem! il est antique, 1817: – Another amateur historian desperately trying to prove he knows his arse from his elbow. I don’t normally indulge in blogging about blogging but recent events have prompted me to pause and reflect upon two and a half years spent blogging about the world of Georgian caricature prints and the purpose and value of the material that has appeared on this site in that time. Casual blogging will never provide an adequate substitute for the sort of rigorously researched academic study that still forms the bedrock of all good historical inquiry but nor is it an entirely ephemeral and valueless medium. Blogging can bring a fresh approach to the prevailing academic consensus and provide a platform from which discussions can be initiated, ideas tested and resources shared. I strongly believe that meaningful historical discourse should not be the sole preserve of those who are either lucky enough to work in academia, or to have a publishing deal under their belts. Nor to I believe that we should refrain from discussing and theorising about history in public in case our errors or unproven ideas are mistakenly interpreted by others as statements of fact. One of the ways in which I feel that I can help encourage others to engage with a subject that I am passionate about is by sharing more of my sources and research materials. As someone who lacks the backing of an academic institution and who is also geographically remote from many of the ‘national’ repositories of historical material which remain tucked away in a corner of southeast England, I have come to view free, open-access, sites like the British Museum’s online catalogue, Google Books, Archive.org and many others as being essential tools of the blogging trade. So, from today you will notice that the sidebar of the blog has a new link to a Resources section. I will be using this as a public repository for my source material and anything else I can share with you without running the risk of gross copyright infringement. Do with it what you will. Let a thousand flowers bloom. 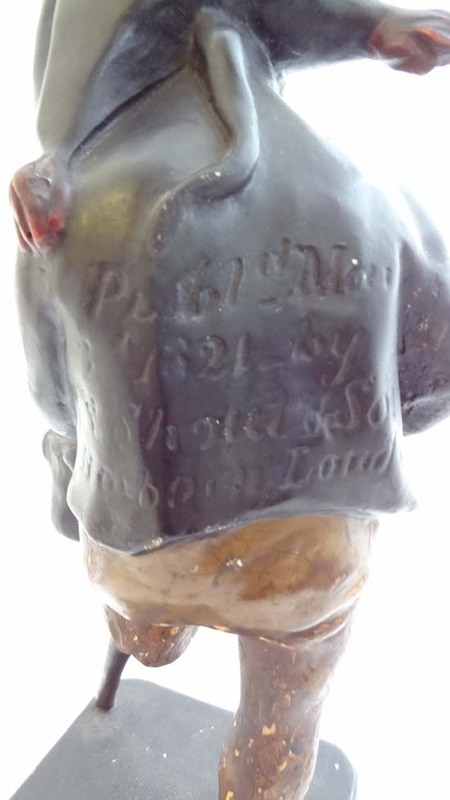 A quick update to share some photos of this unusual plaster cast figurine of Billy Waters, the so-called “king of the beggars” in Regency London. Waters was said to be a former planation slave who had deserted his American masters to find freedom behind the British lines during the War of Independence. He enrolled in the Royal Navy and served at sea for a number of years until he was discharged following an accident which resulted in the loss of his left leg below the knee. Penniless and adrift on the streets of London, Waters was eventually able to eke out a living by playing the fiddle and singing to entertain the crowds of theatre-goers that gathered in the streets around Covent Garden during the evening. 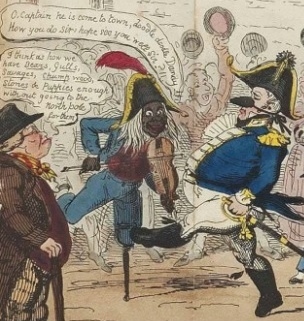 This colourful character eventually captured the imagination of the caricaturist George Cruikshank, who used him to add an air of carnivalesque ridicule to prints such as Landing the Treasures, or Results of the Polar Expedition!!! (January, 1819) and The New Union-Club (July, 1819). 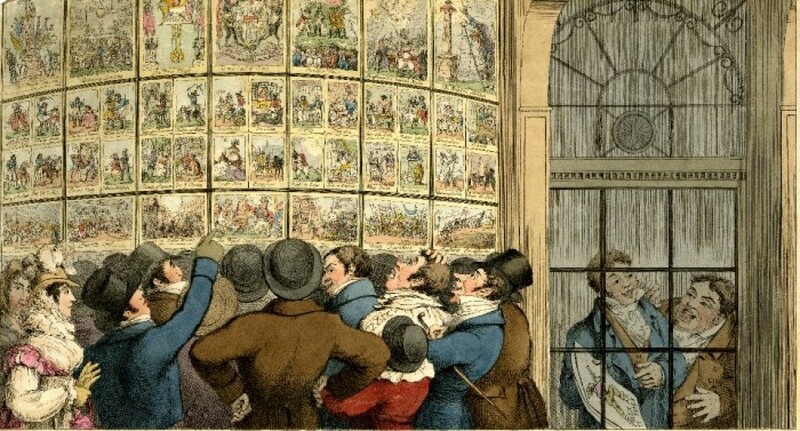 Cruikshank and his brother Robert also included Waters in a number of the illustrations they provided for the hugely successful Life in London and this led to him being awarded a walk-on part in the stage version of the series when it opened at the Adelphi. Ultimately, his fame was to prove counterproductive because, as rumours of the vast sums of money Water’s was supposed to have received for his appearances in Life in London began to circulate around town, he found it more and more difficult to solicit charity from others on streets. 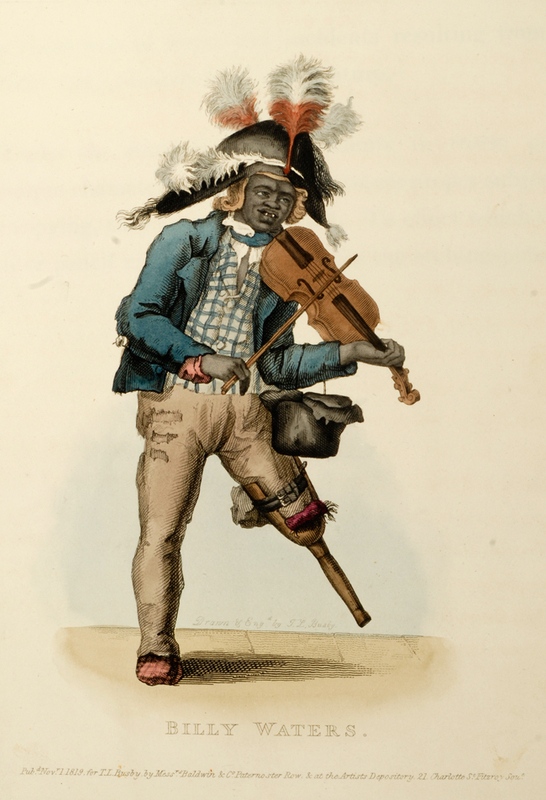 Within a couple of years Waters was reduced to such a state of abject poverty and was forced to sell his violin, most of his clothing and what other meagre possessions he had managed to scrape together. In 1823 he was admitted to the St Giles workhouse and died within days from a combination of hunger and disease. 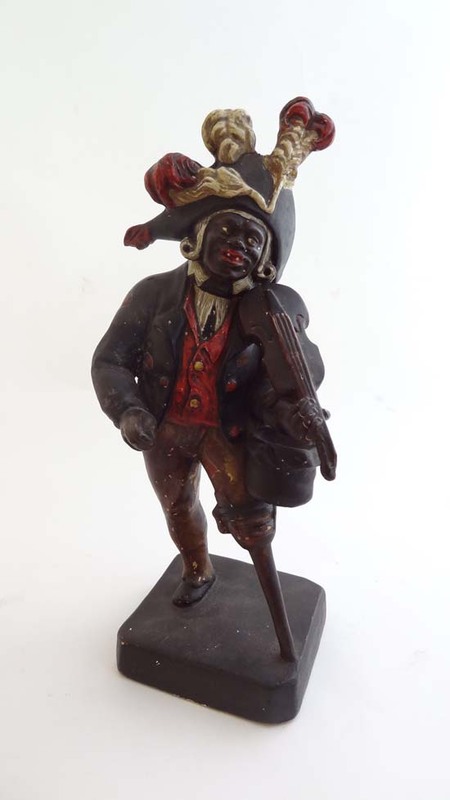 The auctioneer’s listing suggests that this figure was a form of merchandising, designed to cash in on the popularity of the Life in London series but this cannot be correct. The first edition of Life in London had been published in October 1820 and it was already a massive success by the time Shout produced this statue in March 1821. However, Billy Waters did not appear in Cruikshank’s illustrations for Life in London until the July 1821 edition and so would have had absolutely no connection with the series at the time this statue was made. A more likely point of origin seems to be the caricature of Waters which appeared among a series of prints entitled Costume of the Lower Orders of London Painted and Engraved From Nature, published by the illustrator Thomas Lord Busby in August 1820 (left). A quick comparison of the two, reveals that the pose and appearance of the statue is far closer to Busby’s drawing than any image of Waters that appears in the works of George or Robert Cruikshank. So what was this statuette used for? It may have been intended for domestic decoration but at thirteenth inches high, it seems rather large for a display piece and would have towered over conventional ceramic figurines of the period. Another theory, one which takes into account the comparatively rare nature of the piece, is that this may have been a limited edition that was produced for use in commercial window displays or advertising. Either way, it’s certainly an interesting and unusual item which reminds us once again of the links between the trade in satirical prints and other types of consumer goods.